Property Location Located in Norwalk, The Guesthouse at the Norwalk Inn is in the historical district and convenient to Lockwood-Mathews Mansion and Maritime IMAX. This historic aparthotel is within close proximity of Norwalk Maritime Aquarium and Historic South Norwalk.Rooms Make yourself at home in one of the 11 individually decorated guestrooms, featuring kitchens with refrigerators and stovetops. Your Select Comfort bed comes with down comforters, and all rooms are furnished with double sofa beds. Complimentary wired and wireless Internet access keeps you connected, and digital programming provides entertainment. Conveniences include desks and complimentary weekday newspapers, as well as phones with free local calls.Rec, Spa, Premium Amenities Don’t miss out on the many recreational opportunities, including an outdoor pool, a sauna, and a fitness center. 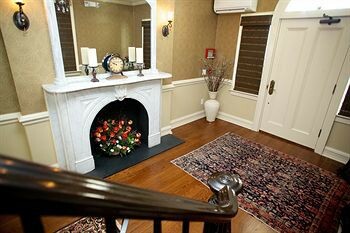 This Victorian aparthotel also features complimentary wireless Internet access, babysitting/childcare (surcharge), and wedding services.Dining Satisfy your appetite at the aparthotel&apos;s restaurant, which serves breakfast, lunch, and dinner, or stay in and take advantage of room service (during limited hours). Quench your thirst with your favorite drink at a bar/lounge.Business, Other Amenities Featured amenities include dry cleaning/laundry services, a 24-hour front desk, and luggage storage. Event facilities at this aparthotel consist of conference space and meeting rooms.